Just over three decades after opening its first restaurant, Toptable Group today announced plans to expand in Whistler with the opening of its second location in the pristine mountain resort, and the sixth property in the hospitality group’s portfolio. 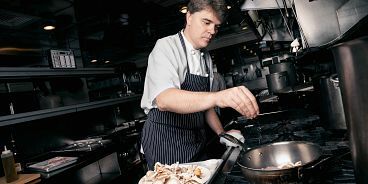 Award-winning executive chef James Walt will oversee the menu development and kitchen operation, while service will be orchestrated by renowned restaurant director Neil Henderson, both of acclaimed Araxi Restaurant. The new Toptable Group venue is ideally situated on the main village stroll and will offer a food and beverage experience not currently available in Whistler. The opening is scheduled for early summer 2015. Toptable Group is celebrating several milestones this year including the 25th anniversary ofCinCin Ristorante and the 15th anniversary of both Blue Water Cafe and West Restaurant. One of Canada’s leading hospitality groups, Toptable Group has four elegant, yet approachable, restaurants in Vancouver and Whistler: Araxi, CinCin, Blue Water Cafe and West, as well as the chocolaterie, patisserie and café, Thierry. More information can be found online at www.toptable.ca.